Welcome! We hope you enjoy exploring our website and learning about our thriving and friendly organisation (if you’re not already a member). We recently celebrated our tenth anniversary and have grown from seven founder members to over 500 in that time. We run self-help education in the Todmorden area through shared learning and creative leisure, via a wide number of special interest groups, monthly talks and Let’s Go trips – all in a pleasurable, stimulating and friendly atmosphere. Anyone no longer in full-time work (Third Agers) can join. About us has much more detail about the local and national organisation, how we’re run, our meetings, groups and our aims. Do browse around! Do join or rejoin us using a simple downloadable form (and £15 for a year). Find out about our regular monthly meetings, with reports featured in News. Check out the results of our members’ survey and give us feedback! Browse our special interest groups, from Philosophy to Ping-Pong. Read about our monthly Let’s Go trips. The Contact page explains how you can phone, email, message us on Facebook or write to us. 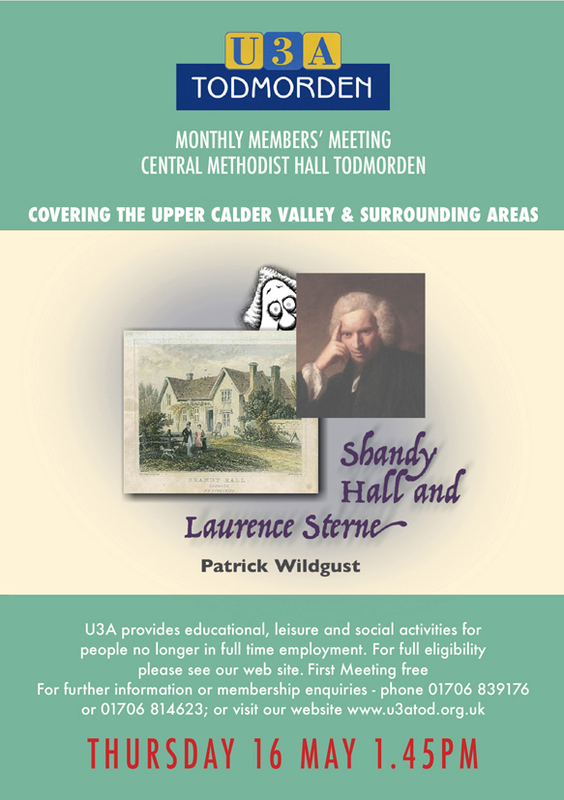 Or try out the next monthly meeting on the third Thursday of every month at the Central Methodist Hall in Todmorden: there’ll be guest speakers, refreshments and lively conversation.